Remember in 2017 when Pantone chose “greenery” as the trend color of the year? We do, and we like to think that this selection reflected the trend that we had already begun to see in wedding décor – ample greenery in bouquets, focal designs and centerpieces and in garland draping tables, chairs, rafters and arbors. Greenery also crossed over to home décor and while you can buy lovely greens to permanently tuck into vases and baskets at some of our favorite retailers, there's nothing that can replace the real thing. Here are some of the things you will need to consider when choosing to use garlands of greenery for your wedding decor. What greens will I use in my garland? All types of Eucalyptus but especially the Seeded, Silver Dollar and Feather varieties, Salal (Lemon Leaf), Bay Leaf, Nandina, Plumosa and two types of Ruscus are beautiful greens for garland. Combinations of greens are very pretty, creating contrast in texture and in shades of green. We also like the look that we get from using only one variety of greenery that is interesting on its own like Bay Leaf or Silver Dollar Eucalpytus. We will spend time during your consultation showing you the look of different greens exploring both their color and texture. How and where can I use garland in my decor? Salal (Lemon Leaf) with Israel and Italian Ruscus. Photography by Stephanie Messick. 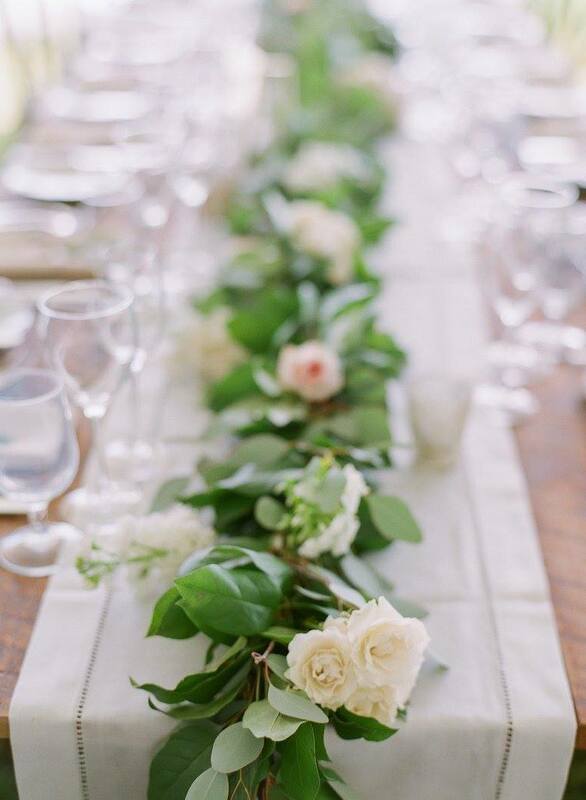 Garlands are perfect for longer farm or rectangular tables as a natural runner. 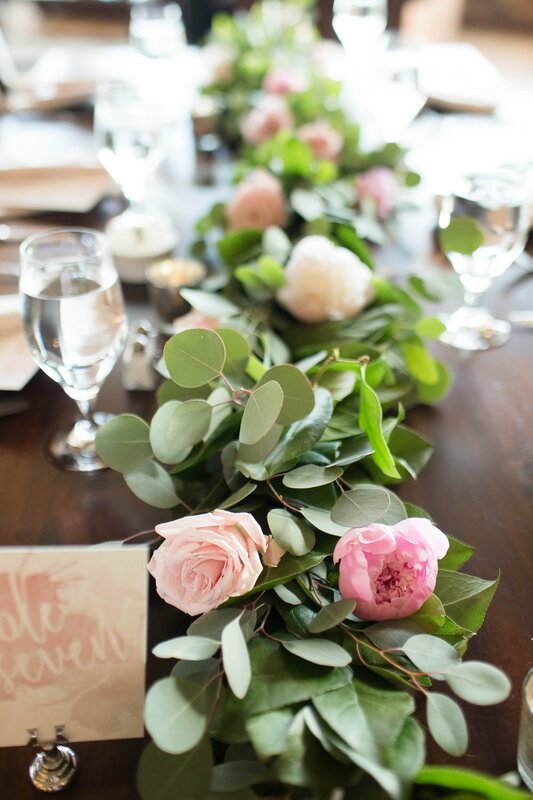 You can extend the garland over the edge of the table or ask for a length that ends just before the edge of the table. 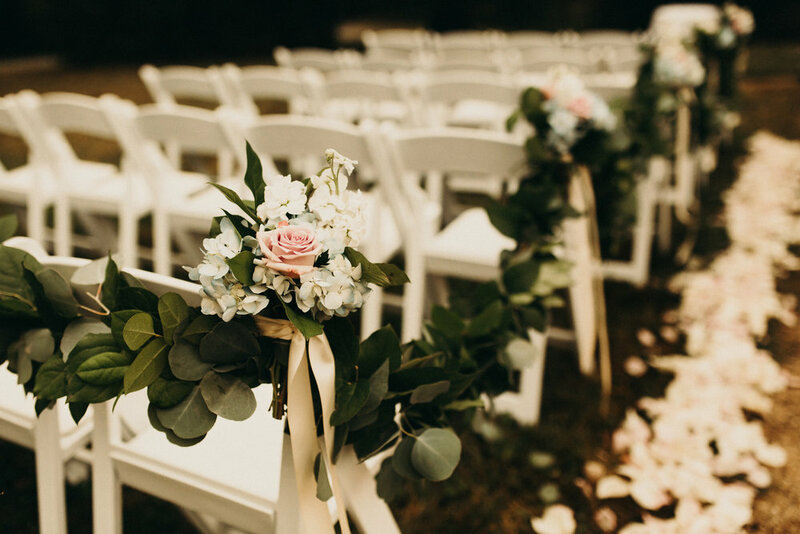 Garlands are also beautiful draped across the back row of your ceremony seating or along the inside chairs creating the look of a raised aisle runner. 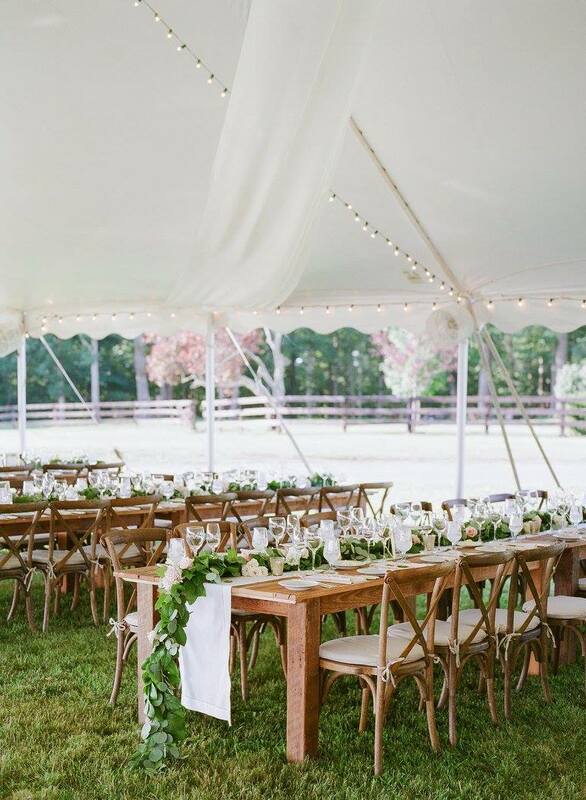 Garland is used on seating charts, sweetheart tables, wine barrels and even as simple décor for the arbors and arches that we find throughout Northern Virginia. You can drape it from rafters or beams and around the interesting doorways at your venue that beg for décor. How much greenery will be used in my garland, how much will it cost? To answer that question, your floral designer will need to ask you a few more questions about the look you are trying to achieve. For example, are you looking for a full, lush look for your tables or leaning toward a sleeker, more minimalist design? Will you be adding flowers and votive candles to the greens or garland? Are you trying to work within a budget per table that will guide your decision? 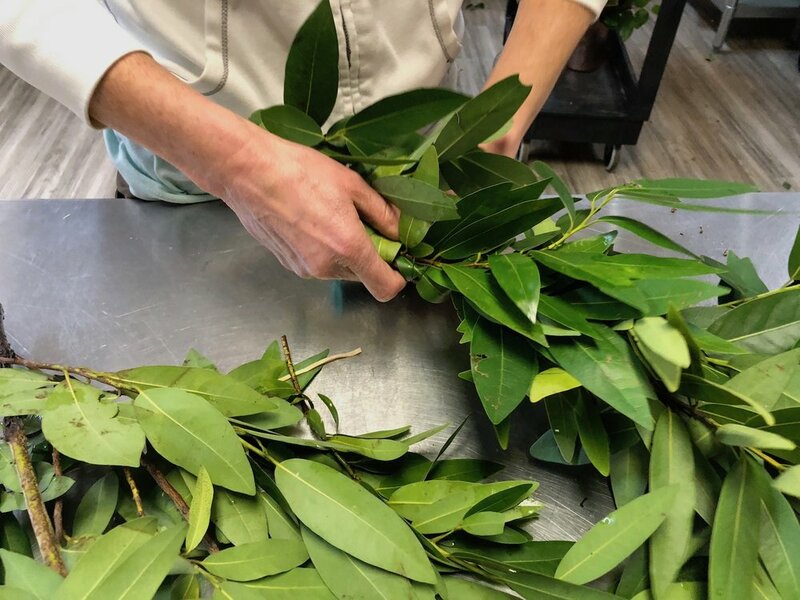 Bay Leaf in a garland being made in our J. Morris Flowers studio. We begin by pricing greenery for your tables based on the type of greens you want to use and thickness that you are trying to achieve. In effect, the price is calculate per foot of garland, similar to the way holiday greeneries are sold. Many wholesalers provide beautiful garlands that include several different varieties of greens in a fairly standard thickness. You may, however, have your heart set on using a unique combination of greens that will have to be handmade. I made very full garland for my nephew’s rehearsal dinner in Massachusetts last Fall with just Bay Leaf. Bay is very leafy giving the garland a lush, full feel with a really lovely scent. You may also want to create a very full look for your tables. I have included a lot of photos in this post so that you can see different varieties of greens in varying thicknesses. The width of your tables should also be taken into consideration. (Your venue coordinator or rental company can tell you the width of the tables they will provide, most are between 36” and 40”). 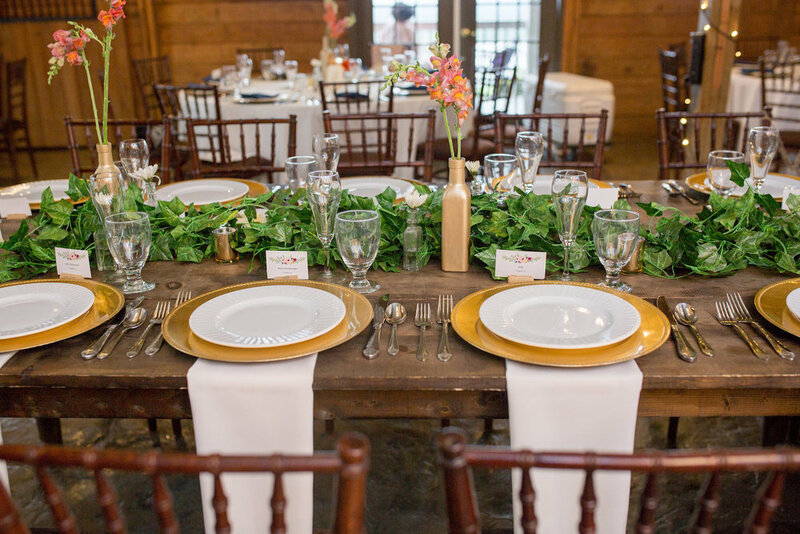 You do want your guests to feel they have room for their glasses and side plates. If the table is thin, you may want thinner garland. On the other hand, a wider table may be begging for thick garland to fill the space. Florals and greens for a Sweetheart table with Seeded Eucalyptus, Salal, Stock, Hydrangea and Roses. Photography by Olivia Markle. How do florals get added to my garland? 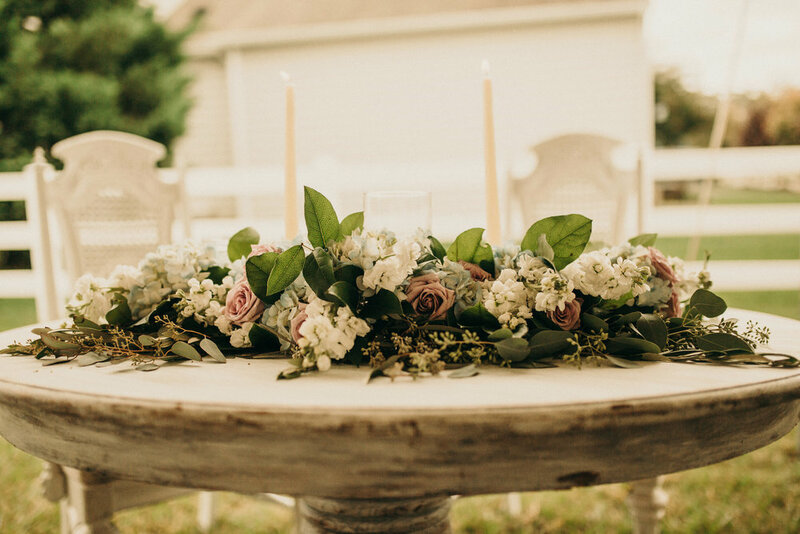 Floral garland is romantic and pretty and allows your guests to get up close and personal with the blooms that you chose to use throughout your décor. 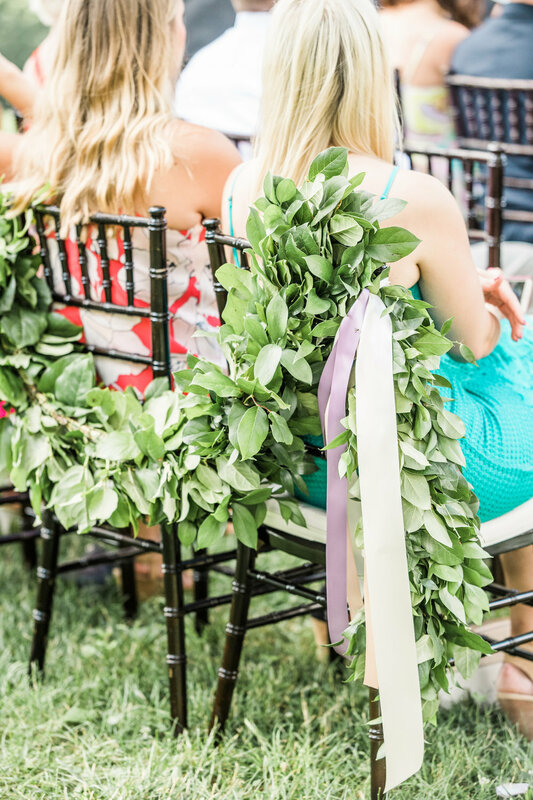 It's probably no surprise that floral garland will be more expensive per foot than the same garland with just greenery. Hydrangea and Red Roses at the Meridian House in Washington D.C. Love Life Images. After the garland is laid on the table, we add flowers in water tubes using some or all of the colors from your original palette. Most flowers will work in a garland including Roses, Spray Roses and Lisianthus, leggier blooms like Snapdragon and Stock or fuller flowers like Hydrangea and Peony. Your florist will need to make sure that your delivery team is large enough to include someone who can create the right combination of flowers and colors for each table. We organize the stems for each table in the studio so that our stylist has equal quantities of color and floral varieties. You’re still going to get a very organic look, but as set-up time passes quickly for a florist, it’s important that we are purposeful in what we do. Additionally, we have to make sure that all loose petals and leaves are cleared away and that candles are set to be lit. Ruscus in a trailing "vine" for simple decor. Staged in our J. Morris Flowers Studio. 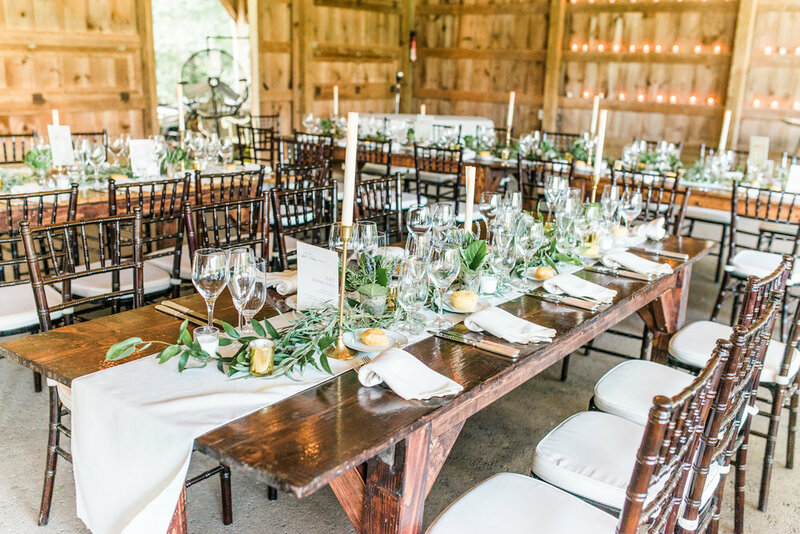 This year, we are starting to see very simple greenery designed to look like a long, thin vine stretching down the length of a table. (The mechanics of this design are hidden during production.) This pretty, minimalist look is also quite affordable. Ruscus, Nandina and Plumosa are leafy greens that come in longer stems, great choices for this style. It's very important, however, that we use greens that can really hold up. I have seen pictures on Pinterest of vines that can achieve but would also wilt very quickly. Your floral designer will help you answer all of your questions about how and where you can use garland. You'll have to make some style decisions but remember to lean on the collection of pictures that you have been creating since the early stages of your planning. This will be an important place to start.